A pair of pale coyotes trotted out of the oakbrush 500 yards away then paused at the far end of the open meadow, apparently trying to pinpoint the source of the sounds that had brought them out of the timber. My electronic caller had been squalling jackrabbit sounds over the distant ridges for a couple of minutes before I had shut it down to scan the countryside. Now, with the cautious coyotes hung up out of shooting range, I needed the sounds again. I settled my .220 Swift on its bipod, slid my hand down along my leg and hit the “on” button on the caller. But nothing happened, and I watched in frustration as the coyotes finally whirled and disappeared back into the brush. This happened years ago when rechargeable batteries still left a bit to be desired. My mistake in this case was twofold. First, I should have made sure the batteries were freshly charged. But the fact I hadn’t brought a mouth call for backup was the really stupid part. Give me another 40 years, and maybe I’ll get this game down pat. But for now, I’m still screwing up and learning from my mistakes. 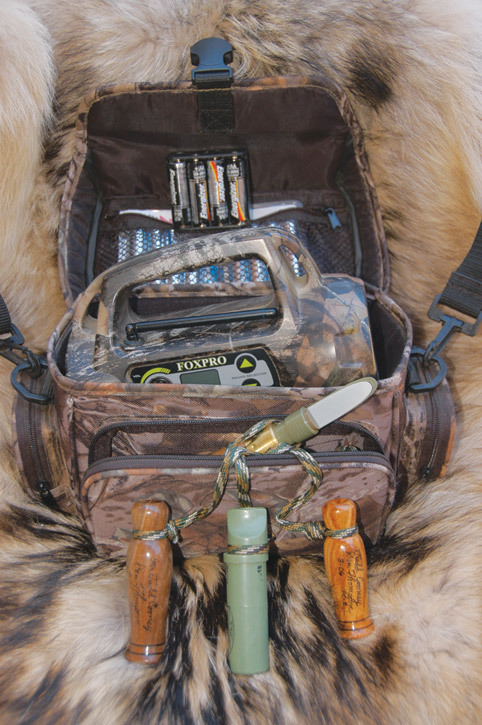 Nowadays, I carry a couple of sets of extra batteries, and I also wear a lanyard around my neck with a pair of mouth-blown calls and an open-reed howler. Last fall, my grandson Zane and I journeyed to Wyoming early in the fall on a pronghorn hunt. We sat in a blind from before daylight until after dark, listening to coyotes howl all round us morning and evening. The third day I took a nice pronghorn, and then we immediately switched to coyote calling. Wyoming is probably the most accommodating state in the union for predator hunters. You can hunt coyotes without a license, and lots of public land is well populated with coyotes. Our first couple of calling stands resulted in Zane flattening a pair of coyotes with a deadly accurate Bushmaster AR-15 in .223. He’s a hard act to follow when it comes to getting on a coyote. I was shooting a Remington 700 in the new .17 Fireball, and I’d taken several coyotes earlier in the season with the rifle. If Zane gave me a chance, I figured any coyote within 200 yards would be dead meat. Wrong again. We were cruising an oil road through the open sagebrush and greasewood high-country desert when a coyote popped out at 100 yards. Zane quickly pulled the truck off the roadway, and I jumped out. I got a good rest across the hood, calmly held on the running coyote until it stopped and turned broadside—and missed the shot. The coyote took off straight away, which should have been an easy follow-up shot, but when I jacked the bolt, the empty case didn’t eject. By the time I fumbled the spent case out and got another in the chamber, the coyote was long gone. My mistake that day was not checking the action before taking the rifle hunting. Somehow, moisture or other gunk had accumulated enough on the spring, the ejector pin or opening in the bolt face to prevent the pin punching the fired case out of the bolt, which caused the jam. When I got home, a few minutes of cleaning the pin hole, buffing the spring and pin on a polishing wheel and then lubricating the whole shebang had the rifle again functioning flawlessly. Keep your predator rifle clean, and use dry lubricant for cold weather outings. The next time I took the Fireball hunting, I checked the action first and doubled on a pair of coyotes. Winter hunting creates more problems than just gunked up rifle actions. I learned the hard way not to exhale on the scope’s ocular lens while lining up for a shot. Several manufacturers claim their scopes are fog proof, but I’ve yet to find one that won’t fog over when a warm, damp breath hits it in below-zero weather. When I was new to predator calling, I used to go out immediately to retrieve the critters I shot. But then a couple of curious coyotes showed me the error of my ways. I’d sneaked into the edge of a clearing in the quaking aspen and set up against some downed logs. An almost imperceptible breeze drifted into my face as I cut loose with a Weems Wildcall. I was still calling at full volume when a big dog coyote came bounding out of the brush at 50 yards, headed for me on the dead run. By the time I spit out the call and got the rifle into shooting position, the coyote was standing at 20 yards. I quickly settled the cross hairs on its shoulder and squeezed the trigger. The coyote dropped, and I walked out to claim my prize. But when I looked up from my kneeling position beside the coyote, I saw two more coyotes standing 50 yards away staring straight at me. My rifle was leaning harmlessly against a ponderosa pine 20 yards away. When calling coyotes, I generally stay put 15-20 minutes minimum depending on weather, terrain and coyote abundance. And, if I shoot one, I again stay locked into position for the full time, calling as ardently as if I’d just started. On one stand in South Texas, I took seven coyotes over the space of an hour and then waited an additional 10 minutes just to make sure I wouldn’t spook any late arrivals. On another stand in Texas, I called up and killed a coyote after three minutes and a second after 10 minutes. When the timer on my watch showed that an additional 20 minutes had passed, I started to get up but then caught a flicker of movement in the dense puckerbrush across the clearing. I teased some mouse squeaks out of a triple-voiced Circe Call, and a big tom bobcat stepped out into the open. For a number of years, taking the first coyote to get within shooting range seemed like the thing to do. But when I was trapping full-time and baiting coyotes to shoot, I learned that first and closest isn’t necessarily the way to go. I set up baits so that I could sneak within easy range with the wind in my favor. I also placed the baits where any escaping coyotes would have to cross a couple hundred yards of open space after I started shooting. With a rest for a flat-shooting .220 Swift, I started taking the farthest coyote first so I’d have more time for the others. The same shot selection can work when calling. When a pair of coyotes comes to the call, quite often one hangs back and presents a perfect standing shot. The sound of the shot then puts the second, more aggressive coyote in high gear. But if you are expecting it, a running-away shot at closer range is no more difficult than a standing shot at 300 yards, and blowing a coyote pup or distress call often slows and may even stop the departing coyote. Another mistake I have made more times than I care to admit is stuffing a couple of rounds in a magazine instead of loading it to capacity, a careless moment that has cost me, when, heaven forbid, I missed a shot or two and ran out of ammo while coyotes were still in range. When you make a mistake, and you will, learn from it—the coyotes certainly will. And of course, nothing can prepare you for everything you will face when calling coyotes. I was calling in Iowa one fine fall day when two coyotes came charging off a hillside across 200 yards of open field. I was sitting in the shadows at the base of an oak tree with a remotely controlled electronic caller 30 yards out in the field. The male coyote was on top of the squalling caller when I flattened the laggard female coyote 75 yards behind. But when I then tried to pick up the presumably departing coyote in my scope, I was shocked to see the big dog less than 5 yards away charging straight at me. With the scope set on six power, I had no chance of getting on that coyote. But I suppose if I’d had a bayonet on the rifle, I might have skewered it as it darted past.